From 1st to 2nd of April, Tel Aviv hosted the CannaTech and according to the organisers one thousand participants from 45 countries gathered in Tel Aviv to join the event. Over the past years, Israel has been among the leading countries in cannabis research. Israel legalized medical cannabis a few years ago. With export possibilities coming up in the near future the industry is expected to grow rapidly. For example the Israeli Health Minister Basson has seen a boom in applications for licenses for growing medical cannabis in Israel, and it seems that things are expected to change positively in the times to come: "So far, 565 farms have submitted requests to the Ministry of Health to obtain licenses to grow medical cannabis,” he said. “Of these, 384 have already passed the first round of tests in the licensing process, and this was after they underwent police checks and land ownership verification.” In addition to that, Ehud Olmert, former Israeli prime minister, is the second Israeli ex-prime minister to join a cannabis company. On the other hand the industry is still facing challenges. There are 40,000 patients using medical cannabis in Israel, and the supply struggles to keep up with the demand. As we reported on Tuesday, a few people were protesting in front of the CannaTech location against the strict new GMP regulations that currently prevent one of the eight supplying companies into adding its produce to the market, making it impossible for patients to access to cannabis-based medicines. Check out our photo report of the event here! 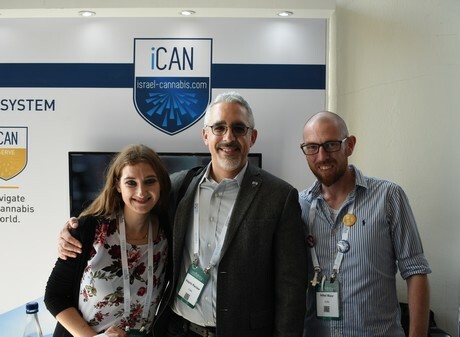 iCan is an Israeli cannabis business incubator that helps entrepreneurs with their cannabis projects. Their booth showed the array of services with which the companies support the medical cannabis industry. So, novelties are underway, and CannaTech was the event were the industry could meet and share opinions, information, best practices and products so to better serve the pharmaceutical industry and patients. Growers, suppliers and patients gathered at the venue, where they could see the recent developments in the market. From data-driven automated systems that allow growers to monitor every parameter of the growing facility, to innovative light solutions that work also as crop protection thanks to UV rays. On the final day, a pitch contest was held, where five companies presented their projects and ideas. Judges were present, listening carefully to the different pitches. At the end of each one, they asked questions to the presenters in order to have a better idea of their projects. Kassi won the pitch contest thanks to their consumer-oriented product.